Dear Esther, and so begins the letter of a lifetime, as you’re immersed in a world you’ve always known but hardly seen. Originally released as free to play modication, the game was entirely redeveloped for a commercial release in 2012. Featuring a relatively new gameplay model at the time, the game was later mockingly referred to as a ‘Walking Simulator’ due to its minimalist player involvement – ultimately the only physical thing for the player to do is explore a Scottish island. Having always wished to travel to an uninhabited Hebridean island this game provided me with the chance to do just that. It’s tranquil peace and the history the island preserves, either through basic settlements, shipwrecks or geology, is immense and is created here in painstaking detail. As you wander throughout the game the character’s voice sporadically gives you information as to the nature of his recently departed wife, as he recounts instances which led to her sudden death and also comments on the nature and history of this island. I found that the game is certainly endemic of mental health and mental illness. The character, player unnamed, is certainly suffering from grief and this has led – over time – to illness and despair. In his grief he has essentially come to the most remote place he can find; and his intentions, although morbid, are incredible to watch. As you join him on what is his last journey there’s a sense of hope and exploration, an understanding of your own life and a peace you simply don’t get from Black Ops. Originally developed as a research project through The University of Portsmouth the game is the creation of The Chinese Room, responsible for such other BAFTA nominated masterpieces as Everyone’s Gone to the Rapture and Amnesia; A Machine For Pigs. But it’s Dear Esther which never fails to capture me, despite how many times I’ve replayed this game, and its entire journey would take you just 90 minutes – something that you can do in an evening, drawing the curtains and submersing yourself in gaming. Accompanying the game is an incredible soundtrack from Jessica Curry, which is nothing short of immense, and has also been released on Vinyl and CD so popular is the demand. I regret deeply missing the opportunity to see an orchestra tour the UK performing this soundtrack while a gamer engaged in playing this game on a big screen. One particular scene, perhaps my favourite in the game, involves walking uphill towards an abandoned bothy built by a long since departed Sheppard. As you climb you can realistically feel the strength in the effort it takes, the game adjusting for the end pushing against you. One can only imagine what might happen if this was ever developed into 3D, and despite the harsh weather conditions, it’s possibly one of the most hopeful moments in the entire game. There’s a real sense of achievement as you finally manage to reach the bothy’s door and enter its tiny space. Eagle eyed fans should also note the original game soundtrack is also available as a free download online from the developer, and you’d be best advised to take advantage of this while it still stands. In August 2018 Sumo Group, the parent company of Sumo Digital, acquired The Chinese Room for GB£2.2 million and thus downsized it to a fourth UK based production under Sumo Group. 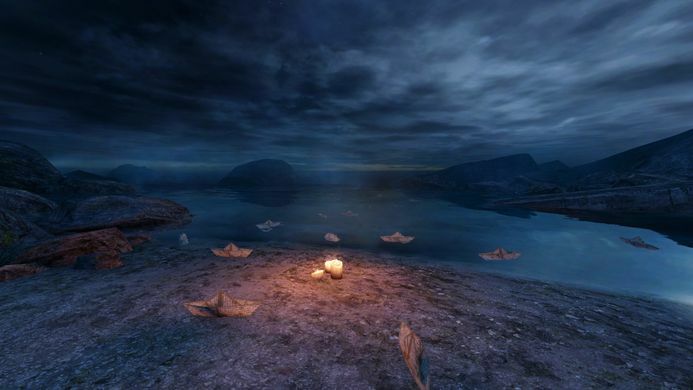 One can imagine both the “end of an era” but also the developers and founders of the group taking some time to consolidate their achievements while playing Dear Esther. Walking Simulators may face criticism because you can, of course, always just leave the house and walk yourself – but the additional location of this game, its unique perspective and narration make it quite frankly unmissable. Now I’m off to hunt down a sealed physical copy on eBay. To replay once more.